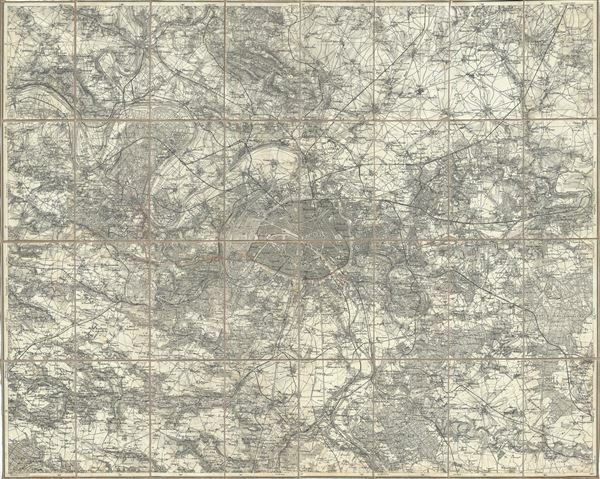 This is an extremely attractive c.1860 pocket map of Paris and its environs by Depot de Guerre. Centered over the city of Paris, it covers the Seine Valley from Meulen-en-Yvelines to Soignolles-en-Brie. Rouvres appears in the extreme northeast and Dampierre-en- Yvelines. The map offers extraordinary detail throughout showing gardens, forests, palaces, fortresses, chateaux, and often individual smaller buildings. Also details railroad lines. It reflects the transformation and modernization of Paris under Napoleon III and Georges-Eugène Haussmann. Though generally speaking this is a black and white map, there are several color markings in black and red ink that seem to suggest some sort of military use, but none that we can specifically identify. Very good. Original linen backing shows minor wear over fold lines.